The London Brewers Alliance beer festival at Vinopolis, by Borough Market, a couple of Saturdays ago was a terrific event, thoroughly enjoyable. In one room were gathered a dozen or more (I forgot to count) stalls representing breweries from in and around London, with the brewers themselves serving their beers and happy to talk to the punters about them. It was the kind of “meet the brewer” show common in the US but almost unheard of in the UK that we really should be seeing repeated across this country. And it’s good to see London’s brewers working together in the 21st century to support each other in exactly the same way their ancestors did almost eight centuries ago, when the Brewers’ Guild was founded at All Hallows’ Church, London Wall. Excellent news, I think, that Wells & Young’s has acquired the Scottish brands McEwan’s and Younger’s from their current owner, Heineken. The announcement last week that W&Y was bringing back Courage Imperial Russian Stout genuinely excited me, and not just because it’s a fantastic beer. It showed that the Bedford company has a shrewd understanding of the sort of niche a medium-sized brewer can exploit with the right brands, and it has cottoned on to the growing desire of drinkers in the UK, the US and elsewhere to drink authentic, heritage beers again. McEwan’s and Younger’s have plenty of heritage – Younger’s No 3, for example. There are two big errors in that one sentence: Edinburgh’s brewing industry is, of course, far older than 1749: the city was stuffed with breweries long before, so much that its nickname, “Auld Reekie” (“Old Smoky”), is sometimes said to have come from all the smoke that came out of the brewery chimneys. In addition, William Younger never started a brewery in Leith, in 1749 or any other year. In fact he was almost certainly never a brewer at all. It’s an ill wind that doesn’t have a silver lining – or something like that. Anyway, I’m delighted to be able to give you a chance to see and hear Nick Sharpe of the St John’s Tavern, Archway, North London, give one of the most passionate expositions on the British pub, its present and its future, that I’ve heard. What I particularly enjoy about Nick’s views on pubs is that they are clearly rooted in a love of pubs’ past, without being fetishistic about it: he’s running a 21st century business at the St John’s Tavern, he delights in being able, thanks to help from English Heritage and his local council, to reflect some of the pub’s 19th century origins in the renovations that have been carried out, but he’s not about to turn it back into the multi-bar warren it would have been when it opened, because we no longer live in a society where Public Bar Man never mixes with Saloon Bar Man. Click on the video you’ll find here, ignore (sorry) the first two minutes 45 second of the video – Jack Adams is a nice guy, but he’s a better interviewer and video maker than presenter, go and make a cup of tea, take the top off a bottle of beer or something until he’s finished – and then come back and listen to Nick talk with feeling and depth about pubs, about why he did what he did with the St John’s Tavern, and what he would like to do with it if his pubco would just let him. Huge guffaws from me at the news that Punch Taverns is to bring back to life for a third time the name Taylor Walker, a former London porter brewer that had strong links with the earliest days of brewing in Philadelphia. Clearly, to be a marketing man you have to have every irony-containing cell filleted from your body. This really does smell of desperately reinventing the past to paint over a tawdry present. Although Taylor Walker’s substantial brewery in the East End closed exactly half a century ago, the name will still be familiar to many drinkers in their late 20s and upwards. This is because in November 1979, what was then the giant brewing/pub owning corporation Allied Lyons decided to revive the name Taylor Walker for its London pub operations, as part of a plan, apparently, to pretend that it wasn’t a giant brewing/pub owning corporation. (This also involved reviving other vanished brewery names, such as Benskin’s of Hertfordshire and Friary Meux of Surrey.) 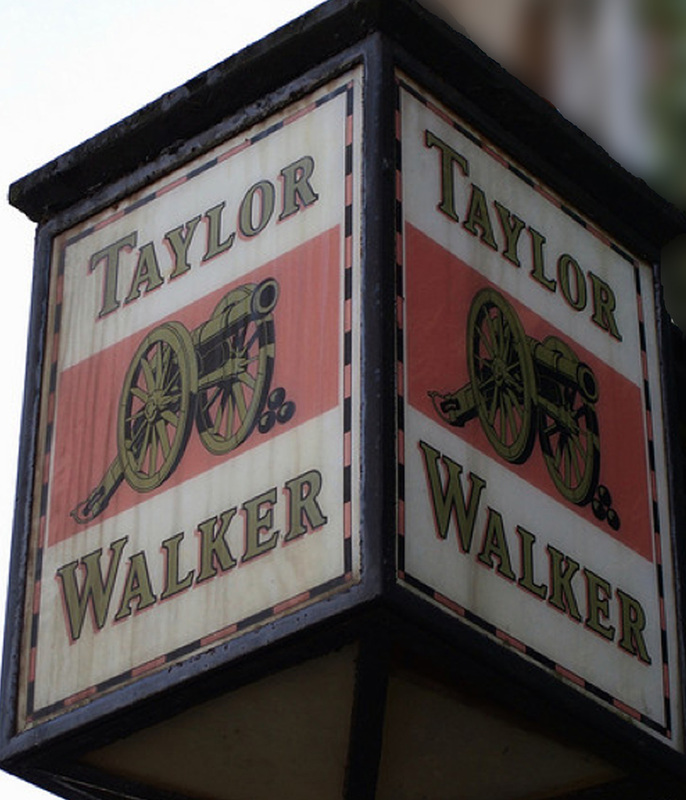 Suddenly hundreds of London pubs had the Taylor Walker name painted on to their fascias (even though many had never belonged to Taylor Walker), while their innsigns sported a “cannon” trademark that had, in fact, belonged to one of the many concerns Taylor Walker had taken over, the Cannon Brewery of St John Street, Clerkenwell. Twenty years later, in 1999, Allied (by now Allied Domecq) sold all its pubs to Punch, and the Taylor Walker name disappeared again. Now, 11 years on, Punch has decided that it wants to dig this twice-dead corpse up once more and slap the words “Taylor Walker” on the front of about a hundred or so of the more “iconic” (for which read “old-looking and marginally upmarket”) outlets run by its managed pub arm, Punch Pub Company. Naturally, Punch’s PR company has screwed up the history, claiming in the announcement of the revival that “the Taylor Walker name dates back to 1730”. No it doesn’t: the concern never became Taylor Walker until 1816. But the history of Taylor Walker as recorded pretty much everywhere is full of errors: you’ll see it stated, for example, that the brewery “moved to Fore Street, Limehouse” and then “moved to Church Row, Limehouse”, when in fact it stayed exactly where it was, expanding from a small 18th century brewhouse to eventually cover more than seven acres, which abutted Fore Street (now part of Narrow Street) on one side and Church Row (now Newell Street) on another. 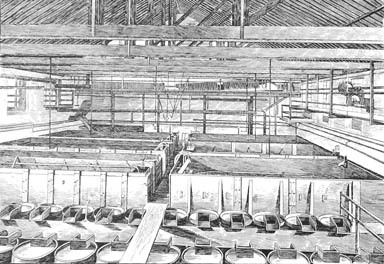 Enough of the snidery of the last two posts: let’s get back to what this blog is famous for quite well known for around the world among a very small number of people: shining a torch on obscure bits of brewing history. 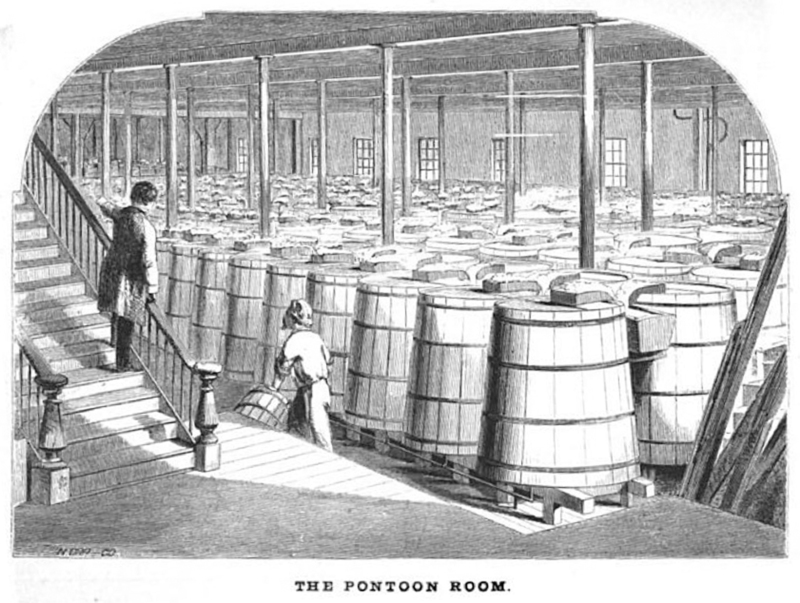 I remarked at the time that “ponto” was a curious word, not in the Oxford English Dictionary, and guessed that it might be derived from “pontoon”, because the “peculiarly shaped overflow lip” (you can see some here, pictured in the Porter Tun Room at Whitbread’s brewery in London) looked like the end of a pontoon or punt. Those few of you who caught my 15 seconds of fame tonight on the London ITN regional television news, talking about the announcement that AB InBev is going to close the Mortlake brewery, I’ll tell you a secret: that wasn’t the Thames at Mortlake behind me. It was actually about nine miles down river at Wapping, which is where I was when ITN got hold of me and asked if I’d be interviewed about the history of the brewery. I was still within a short distance of two once-huge London breweries, though, Courage, hard by Tower Bridge, closed 1981, and Hoare’s, between Wapping and St Katharine’s Docks, which had been one of the “Big Twelve” London porter brewers, and which shut in 1934. Hoare’s has, effectively, vanished: Courage’s brewery still stands, a monument to London’s former position as one of the great brewing cities; probably, in the 19th century, the greatest brewing city in the world, which was the point I was trying to make to the ITN man. The closure of Mortlake means the disappearance of the last big brewery left in London. In 1971, the year Camra was founded, the capital boasted a still-magnificent line-up of well-established giant brewers: Whitbread, on the edge of the City, founded 1742; Truman’s, in Brick Lane, dating back to at least 1666; further out in the East End, Mann’s in the Whitechapel Road, built 1808, and their near-neighbours Charrington’s in the Mile End Road, first recorded in 1770. 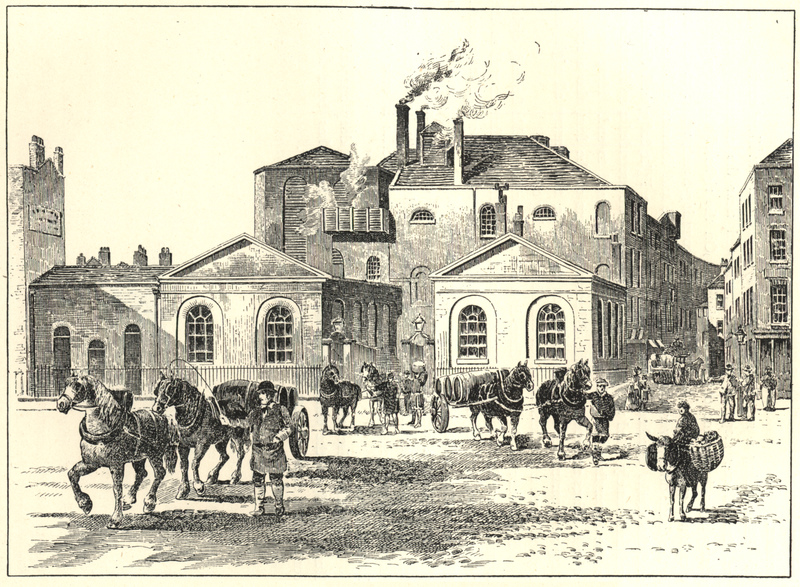 Courage was still brewing at Southwark after more than 180 years, Guinness, the newest big brewer to open in London, was producing a river of stout at its 35-year-old Park Royal brewery. Out in the suburbs to the East, Ind Coope was making beer at Romford, and Watney’s still had Mortlake, renamed the Stag brewery after the company’s original Stag brewery in Westminster, closed 1959.